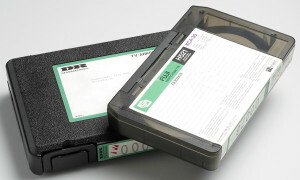 Mass Productions is currently busy digitizing over 500 videotapes for the Massachusetts Institute of Technology. The archive contains Umatic, Betacam, VHS, and Mini DV videotapes. The 3/4 umatic videotapes go back as far as 1977 and require baking and cleaning before transfer. The videotapes contain a lot of historic footage of MIT. We restored a 1971 inauguration concert for Jerome Wiesner featuring a live performance by the late Pete Seeger! We are preserving the decaying videotapes to digital video files for archival storage. Contracted Mass Productions to digitize 500 rare Jazz records from the school’s music library. The digital files were then imported into iTunes, and a complete music database created. This allowed students to access the school’s Jazz music library from any computer on campus, as well as from home. It also preserved and protected the schools valuable record collection. The school hopes this project will pave the way to having their entire record library of over 6,000 titles converted to digital over the next few years.